I love books, I fell first for Amelia Bedelia's unwitting hijinks and Angelina Ballerina's delicate moves. Almost 25 years later I've replaced paperbacks with my iPad and I know I don't read as much literary fiction as I should. Whether it be pictures, touch, your mother's voice or even makeup -- books help our imaginations to thrive, they also offer a few moments of pure bliss and escapism. Ultimately, it's up to you and the feverish pace you've chosen to gobble all of the words told from front to back. I too want to know where the sidewalk ends and see all the places Harold was able to visit because of his purple crayon. Bobbi & Katie might not be your traditional story, but its contents inside are certainly telling. Eyeshadows, Lip Pots and Eye Pencils, oh my! If this book had a jacket, this is what it would say.. Created by Bobbi Brown and curated by Katie Holmes, Bobbi and Katie features possibilities, new opportunities, a chance to fall in love, a way to colour your world and eventually, you'll be intoxicated by the presence of such subtlety. 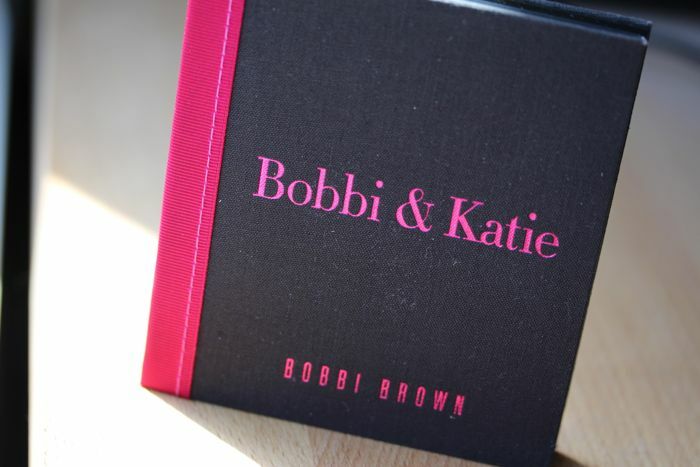 If you're a makeup newbie, a Bobbi-phile or appreciate softer colours, then I suggest you pick up your very own copy of Bobbi & Katie. The pot rouges are multi-taskers -- perfect for painting your pout or for cheering up your cheeks. Flip back to the index and search for eyeshadows, you'll find three metallics, a shimmer, a sparkle and three basics listed there. Finally, neatly tucked in the spine is a sickly sweet Chocolate Eye Pencil. In the look above I'm wearing six of the eight eyeshadows (Pink Chiffon and Cream didn't make the final cut), on my lips I'm wearing Pretty Powerful and last but not least, I applied Chocolate to my upper waterline (this technique is known as tightlining). As for the rest of the look I'm wearing Benefit's Gimme Brow and Bobbi Brown's French Pink on my cheeks. The colours are easy to use, last and will suit light and medium complexions. 9 out of 10 bags — Despite having to dig a bit deeper in my pockets, I'm glad I picked up Bobbi & Katie. Jenny of My Funny Valentine may've convinced me to pick up Bobbi's Long-Wear Gel Eyeliner. Gotta go and brush up on my cat eye skills now.